I read all about it this morning at newcritics. I agree with all the winners but I wish Abigail Breslin would have won Best Supporting Actress (I didn’t see Dreamgirls). But my favorite moment was that Cadillac ad with the M Ward song. It’s the first and only Cadillac ad that I ever liked. UPDATE: Andrew asked for the video in the comments. After a bit of googling and YouTubing, here it is. I love this ad. It’s more like an M Ward music video than a car ad (at least to me) and it’s the first time in a long time that I ever would even think about buying a cadillac. 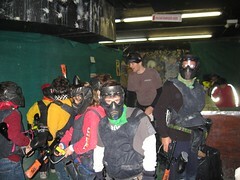 Josh’s friends convinced their dads to take them to Long Island City for an afternoon of Paintball. The boys were a little scared at the start. Would it hurt to get hit? How come the guns were so loud? But after about one second in the first battle, they couldn’t get enough of it. And neither could the dads, at least this dad. At one point I thought I was Rambo. I charged the middle, jumped over the barrier, hit the ground, crawled forward, and took out the other side. Now I am not much for guns and killing and war. But I must say, a little pretend battle during a cold February afternoon was pretty damn fun. They are blogging the Oscars at newcritics. They’ve got some great posts up about some of the best picture nominations. I am personally rooting for Little Miss Sunshine but I expect that The Departed will win. Apparently Blue Girl will be blogging the Oscars live tonight at newcritics. I’ll make sure to check in. Raj emailed me yesterday "Arcade Fire’s going to be on SNL". I emailed back that I’d Tivo it. He emailed back "or watch it on YouTube on sunday morning". So that’s what I did. They did Intervention for their first number and ended that with some guitar string ripping and guitar smashing. Rainn Wilson (aka Dwight from The Office) introduced. They came back and they played Keep The Car Running which I liked better. Philip emailed me this morning about the Arcade Fire show. I told him I’d watched it. He emailed back his favorite SNL performance ever. Peter Tosh and Mick Jagger doing Don’t Look Back. It’s awesome, so here that is too. Talk about time shifting. I know that a lot of people watch the little FeedBurner chicklets that show how many subs any given blog has. So what does this mean? Not as much as everyone thinks. FeedBurner has a really good post up on their blog explaining why these numbers have been going up a lot recently. The main reason is that Google has started to report their feed subs to FeedBurner, both Google Homepage (their MyYahoo/Netvibes like service) and Google Reader. Since Google has about 20% of the reader market, everyone’s subs went up on average 20% recently. The other thing that goes on is some of the aggregators auto subscribe their users to the top blogs. So some blogs get huge boosts in subscribers. My blog has ~5000 subs from Rojo. I don’t think they are real but they get included in my total of 19,714. So you can see the number of people who read this blog each day via feeds is pretty close to the number who read it on the web. And there is certainly some overlap (that would be a great number for FeedBurner to calculate and I am sure they can do that). So on any given week, this blog gets between 5,500 and 6,500 readers, about 40% of which are via the feed and 60% are via the web. So what is the relevance of the 19,714 number? Not much actually. It’s the number of people who at one point have subscribed to this blog. 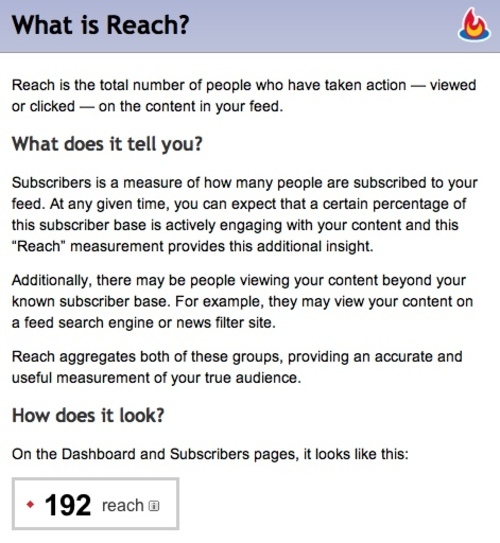 If you subtract the daily reach of approximately 3,000 people, you see that over 16,000 subscriptions are out there but not particularly active. I suspect the same is true of Techcrunch’s 279,000 readers as well. If their feed subscribers are like mine, Techcrunch’s daily reach would be about 50,000. That’s still a huge number of people reading a feed every day. Randal commented on my Modest Mouse post that he likes Missed The Boat better than Fire It Up. You know what, I do too. Thanks Randal. I’ve missed a lot of boats over the years. I used to worry about them. Not any more. I was listening to iTunes Party Shuffle (the best thing about iTunes in my opinion) this morning and a Dinosaur Jr. song called Outta Hand came on. I love that song. 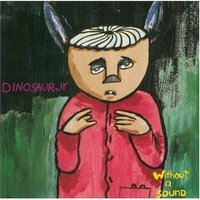 So I went to my library, found the record, called Without A Sound, and listened to it in its entirety. This is one of my favorite indie rock records from the mid 90s. Here’s another gem from the record. Jeff Jarvis calls it "Google Juice" and I like that term so I am going to use it to describe the effect of having a site that gets indexed high in Google search results. 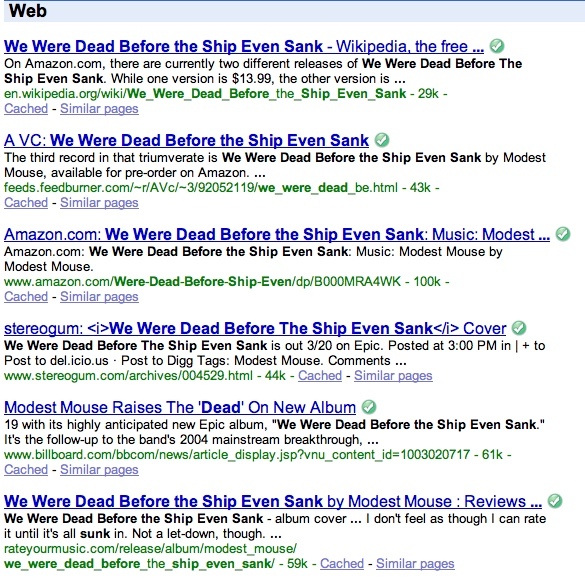 I was going through my FeedBurner dashboard this morning looking at my feed and site stats and saw that I got 36 visits (about 1% of all my visits yesterday) from searches on "we were dead before the ship even sank". 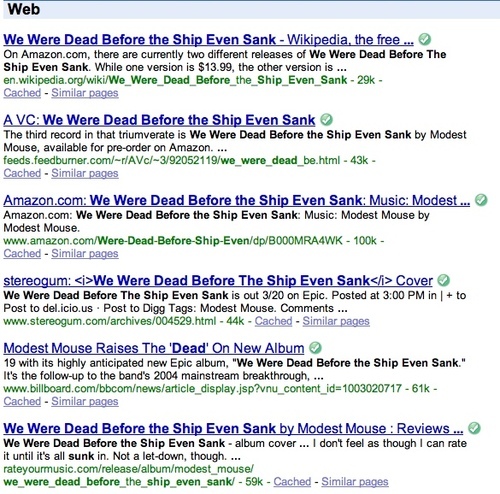 That’s a lot of words to write in a Google search so those people were clearly looking for the new modest mouse record of the same name. Here’s the search result page they got. Number one is Wikipedia, the owner of more Google Juice than any other website in the world. Number two is this blog. Amazon gets the third spot. Stereogum, Billboard, and Rateyourmusic.com fill out the rest of the top six spots. Modest Mouse’s own website barely made the first page. I am not complaining. I got 36 visits I would not have otherwise gotten yesterday. Maybe one or two of them liked what they saw and might come back. But Google Juice is not a perfect system by a long shot. Everytime I see this effect and I see it a lot, I think two thoughts. The first is that I can’t ever change my domain and the second is that there’s a lot more headroom in search. I don’t think this is evil enough to make it into my Internet Axis of Evil (bottom left sidebar) but I am getting totally fed up with getting outlook invite spam. I am sure that most people that send these invites think they are doing a good thing. But they are not. Because inviting me to an event that I have no intention of attending but gets into my calendar unless I take the extra step to decline it is worse than spam. I can ignore spam. I have to go one step further to decline outlook invite spam. And using outlook invites to start the process of scheduling something is equally annoying. I decline because the time doesn’t work for me. Then I get another. Which I have to decline again. I’d just ignore them, but then my calendar gets clogged up with meetings I don’t intend to go to. The way to do this is to use regular email to schedule something and once its been agreed upon, send the outlook invite. Sending me one before I’ve agreed to attend a meeting is bad email etiquette. This goes into the category of "it makes my life easier so I am going to use it even though it makes your life worse". It joins the practice of having your assistant call me and then put me on hold until you can get off the call you are on. The people who do that to me are sending a signal that their time is more important than mine. And I take notice of that. I would never do something like that. And I would never send outlook email spam either. I am not sure which link I followed to find Startupping, a new online resource for the world of entrepreneurship and startups, but I like it.